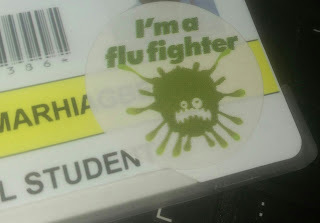 Your friend who works for the NHS gets a flu jab, and then makes a Facebook post about it, complete with photo of themselves brandishing their "I'm a flu fighter" sticker and/or their shoulder with a plaster on it as evidence. Perhaps we've all seen something like this. I had just finished my amazing, once-a-week, free cooked lunch (one of the many perks of working at the Royal Bournemouth) and was on my way out when I came across a lady at the door giving out flu jabs. A fellow medical student stopped straight away and started filling the form out. I was much more hesitant. I picked up a form, but I only looked at it, suddenly faced with the fact that I don't like injections. I was scared. By no means was it a rational fear - after all, in less than a year's time, I'll be poking needles into people for a living. But that fear was there all the same. I was reminded of the unshakeable dread I always felt as a child in the lead up to getting an injection. The lady interrupted me while I was deep in thought. "Would you like a flu jab?" "Yes," I said quickly. I made the decision before I could think myself out of it. I filled out the form and then I had the jab. I'm at home now, my shoulder still aching a little from the jab, and now I wonder what made me get it. Loving my neighbour as I love myself, perhaps (herd immunity and all that)? Well, I think about my friend whose Facebook photos and blurb about getting the flu jab I had quickly scrolled past, thinking, "Boring... " and it occurs to me for the first time that that Facebook post has succeeded in at least one of its goals. I got the jab, didn't I? This whole social media thing is a double-edged sword. I scroll through countless videos and posts about all sorts of silly things, knowing that I'm contributing to an online bragging culture and I'm wasting my time, and I continue to scroll anyway. But then I hear some good things, and do good things as a result. People who might normally be silent share their narrative, and, even if only briefly, I hear it. I give people an attention that they desire.